Founded in 1971, Cardinal Health (CAH) is one of the world’s three largest medical supply and pharmaceutical distributors. The company essentially acts as a middleman that sources more than 400,000 medical supplies and drugs from over 5,000 pharmaceutical and medical supply companies. Cardinal Health then distributes these products to various clients along the medical industry supply chain. The company’s operating margin typically sits between 1% and 2%, reflecting the small sliver of profit Cardinal Health makes on each sale. The firm therefore depends on generating a high volume of sales to turn a meaningful profit. Pharmaceutical (90% and 85% of fiscal 2017 sales and segment profits, respectively): distributes branded and generic pharmaceutical, specialty pharmaceutical, over-the-counter healthcare, and consumer products to retailers, hospitals, and other healthcare providers, including over 24,000 pharmacies, 140,000 doctors offices and clinics, and 85% of hospitals in the U.S. It also serves clients in China. The pharmaceutical segment offers data and drug supply and distribution management (i.e. back office logistics) services to its clients and suppliers as well. Medical (10% and 15% of fiscal 2017 sales and segment profit, respectively): manufactures, sources, and distributes medical, surgical, and laboratory products, including cardiovascular and endovascular products; wound care products; surgical drapes, gowns, and apparel; exam and surgical gloves; fluid suction and collection systems; and incontinence, enteral feeding, urology, operating room supply, electrode and needle, and syringe and sharps disposal product lines to hospitals, ambulatory surgery centers, and clinical laboratories in the U.S., Canada, Europe, and China. Over 90% of the company's sales are derived in the U.S. The major investment thesis for Cardinal Health hinges on a fast-aging population driving U.S healthcare spending, especially on pharmaceuticals and medical supplies, much higher over the coming decade and beyond. For example, according to a recent report by the Centers for Medicare & Medicaid Services (CMS), U.S. healthcare spending is set to rise from $3.4 trillion in 2016 to $5.5 trillion by 2025, or 20% of GDP. Retail pharmacy sales meanwhile, were around $300 billion in 2016. In other words, the U.S. healthcare sector is expected to grow 5.6% annually for the next decade, about double the rate of overall economic growth. 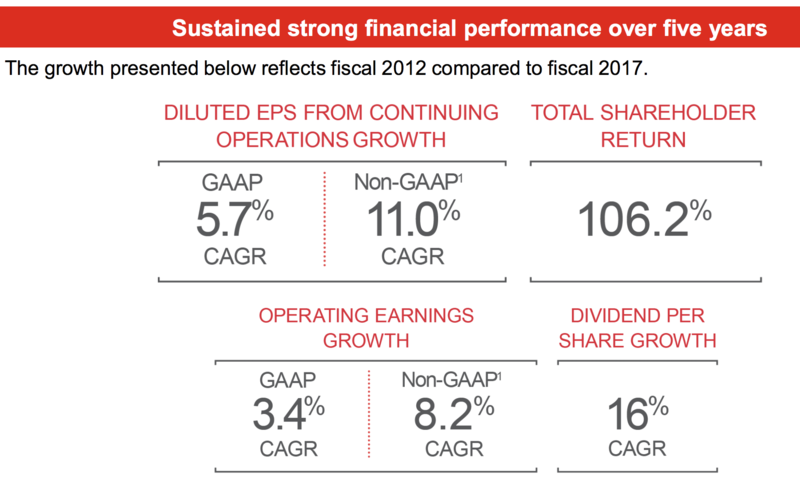 And indeed the past five years have been a time of strong growth for Cardinal Health, with impressive increases in the bottom line resulting in substantial capital returns to shareholders, including significant dividend increases. Cardinal Health benefited from the boom in generic drugs over the past five years. Tens of billions of dollars worth of brand-name drugs lost patent protection in 2012, for example, resulting in a boom in generic competition over the following years. Generic drugs carry higher margins for Cardinal Health compared to branded drugs. As generic drug pricing increased, the company enjoyed a boost to its gross profits. However, the tide is now going back out. Most of the entire pharmaceutical value chain is under pressure to cut costs and make healthcare more affordable. Many pharma businesses are moderating price increases on their drugs in response to increased political pressure. Generic drug prices have also been hit by because of faster approvals by the Food and Drug Administration (resulting in more generic drug supply) and a price-fixing investigation, according to The Wall Street Journal. Equally important, pharmacies and other players across the medical supply chain have meaningfully consolidated in recent years as they faced increased margin pressure from lower reimbursement rates. This consolidation trend has resulted in major pricing pressures on all medical wholesalers because large customers can play the industry giants off each other. For example, in 2012 Safeway cancelled its drug supply contracts with McKesson in favor of Cardinal Health; however, in 2016 Safeway decided to drop Cardinal after its 2015 merger with Albertsons. Similarly, Cardinal Health had a long and profitable relationship with Walgreens up through 2012, until Walgreens signed a 10-year service agreement with AmerisourceBergen. Cardinal was able to come back though, thanks to the creation of Red Oak Sourcing, a 50/50 joint venture with CVS Caremark designed to streamline their respective drug supply chains and lower costs through economies of scale. Another problem for medical wholesalers has been that a traditional source of higher profits, independently owned pharmacies, have now started banding together in Group Purchase Organizations, which increases their collective purchase power over suppliers. Simply put, the economics of the drug distribution business appear to be structurally changing. A company like Cardinal Health will always play a role, but the middlemen seem increasingly likely to bear the brunt of healthcare reform and sell-side consolidation. Cardinal Health reported low-double digit drug deflation in fiscal 2017, and another mid-single digit decline is expected in fiscal 2018. While rising demand from a growing and aging population could eventually stabilize wholesale drug distribution, even with the growing supply of generics, today's environment could very well be the new normal. DrugChannels.net provided an excellent review of the margin pressures that wholesale distributors face. You can read their take here. Assuming sell-side price pressure remains high, there is increased risk that competition will only increase between the three companies that control almost all of the drug distribution business (McKesson and AmerisourceBergen are the other two). Since distribution is largely a scale game, these rivals might battle even harder with each other for market share, and the stakes are high. For example, CVS Health (CVS) accounted for 23% of Cardinal Health’s sales last year, and its five largest customers totaled 50% of overall revenue. Losing major customers or having to further concede on pricing to retain them could really impact the company’s bottom line, especially if Cardinal Health is unable to negotiate better terms with its drug manufacturers. Management’s decision last year to take on substantial debt to acquire some of Medtronic’s medical products for $6.1 billion could be another signal that Cardinal Health’s core pharma distribution business might not have the favorable long-term outlook that the company once thought (thus there was increased pressure to diversify). Adding some of Medtronic’s products will likely provide economies of scale in medical products manufacturing and sourcing (helping profitability) while increasing the company’s product breadth. Cardinal Health's medical segment also enjoys much higher margins than its pharma segment, so expanding here could make some strategic sense. However, this still seems like a price-sensitive business that can be challenging to compete in. Cardinal Health may not have much of a durable competitive advantage here either. There are several significant risks to understand before investing in Cardinal Health. First, the medical industry is highly complex, with five levels of supply chain (manufacturers, distributors, pharmacy, pharmacy benefit managers, and payers – insurance companies or Medicare/Medicaid). This is made more so by the complex interplay between private and public funding sources and a desperate need to lower medical costs, which have been far outpacing inflation for over 30 years. Combined with the razor-thin margins of many parts of the supply chain (especially distribution and pharmacy), there is an endless shifting of the various players into often confusing relationships as everyone attempts to maximize margin while putting the screws to their own suppliers. Simply put, it is a very complex and dynamic landscape. Investors considering the space need to be comfortable with the highly dynamic nature of this business and trust that management will be able to continue growing sales, earnings, cash flow, and the dividend in the coming years despite occasional setbacks, such as loss of supply contracts with major retailers. Then there’s the constant threat of increased government regulation of medical prices, or even just Medicare/Medicaid potentially being able to negotiate bulk purchases (currently illegal), which could result in ongoing industry uncertainty and potentially permanently lower margins. Next, we need to consider that Cardinal Health’s plan to grow and diversify into higher-margin medical devices could run into trouble in two ways. First, there is execution risk, specifically of overpaying and failing to achieve expected synergistic cost savings. In other words, large blue chips that are struggling to grow often attempt to reach for growth by acquiring companies outside their area of expertise. This is why the far majority of large M&A deals actually end up destroying shareholder value. Next, Cardinal Health has been using the current period of record low interest rates to take on a large amount of debt to fund its medical products purchases. For example, $5.2 billion out of the $6.1 billion purchase price for the Medtronic deal was funded with debt. In a rising rate environment, Cardinal Health could be forced to slow down its pace of acquisitions to deleverage its balance sheet. Finally, we can’t forget that just as the world of medical wholesaling is marked by cutthroat competition and a constant battle to maintain margins, the same is true for medical devices. After all, Medtronic is a dividend aristocrat with decades of dividend growth under its belt and arguably one of the medical device industry’s top managed names. In today’s challenging healthcare market, in which prices for such assets are falling, one might assume that the product portfolio Cardinal Health is buying isn’t necessarily growing like a weed or generating extraordinarily high margins. Of course, given that Cardinal Health’s margins and returns on shareholder capital are currently below the industry average (in an industry already marked by rock bottom profitability), there is a chance that medical segment acquisitions will improve the company’s overall margins and returns on capital over time. Speaking of margins, Amazon's potential impact on the space has yet to be felt, too. There have long been rumors of the company getting into the healthcare delivery space, especially the delivery of prescription drugs and medical supplies. Cardinal Health believes its prices are already significantly below other products that are out there and thinks most doctors have unique product preferences Amazon is unfit to help them with. Management is also banking on the company's size, scale, and increasing focus overseas, where Amazon has less of a presence, helping it combat any future threats. Only time will tell how the competitive landscape shakes out, but the high fixed costs and low margins in this business really amplify any changes in revenue, for better or worse. The healthcare sector’s desperate need to cut costs means the future of the medical distribution industry will likely be one where scale is larger, but companies like Cardinal Health will struggle to maintain their already low margins. Management’s plan to diversify into higher-margin medical equipment and wholesaling has its own risks but could return the company to solid high-single digit growth beyond 2019. However, given the firm's token dividend increase last year, along with the ongoing fear, uncertainty, and doubt that pervades the industry (and all of its complexities), Cardinal Health doesn't seem suitable for a conservative dividend growth portfolio. Owning businesses with greater pricing power and more controllable competitive advantages is preferable. Although Cardinal Health’s relatively low valuation may look tempting, it could be more of an acknowledgement of the company’s structurally lower growth profile and the risks faced by management’s debt-fueled expansion into medical products.